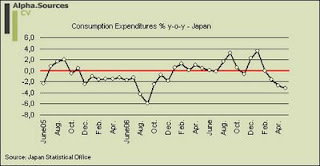 Japan - Still Fighting off the Recession; When Will the Strength Ebb Out? Regular readers will have noticed (or not :)) that last month did not feature, as per usual, a note on the development of the Japanese economy. This was not the intention but since the April data came out around the same time as I had to hand in my final paper for the year time, as ever, became too scare a resource. There is not much need to worry however. In the following I will thus continue my ongoing analysis on two months' worth of data as well as loads of timely analysis from other sources where, as usual, Ken Worsley and Takehiro Sato/Feldman from Morgan Stanley have my complete attention. In accordance with tradition four overall themes will form the backbone of the analysis; trends in prices, domestic demand figures, industrial output/exports, and finally the JPY which as ever is the subject of much attention in currency markets and beyond. When it comes to prices it could seem as if Japan's quick return to inflation in the core-of-core index was nothing more than a blip. 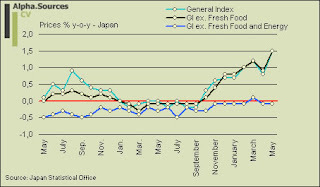 As can consequently be observed from the graph below Japan is once again stuck in deflation measured by the core index stripped of energy and food input; both April and May thus saw a decline in US style core prices of -0.1%. 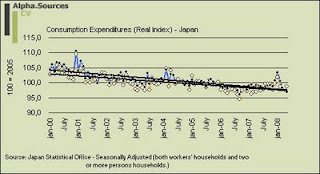 The graph above also recounts the story of global stagflation with Japan as perspective. Thus, while core-of-core inflation remains in deflation the core general inflation index has shot up on the back of global headline inflation pressures. As will be described below this is obviously having a non-negliable effect on an already lackluster Japanese consumer. More generally, I have been emphasizing this chasm between core and headline inflation for quite some time as well as I have been pointing out that inflation in Japan was solely of a cost-push nature rather than demand-pull. Indeed, the whole discussion of "spill-over effects" in Japan and how activity in one part of the economy (corporate capex/exports) would automatically lead to an increase in domestic demand seems now to have finally been laid to rest. This is a welcome structural break in the discourse as pundits and analysts have been waiting for these positive spill-over effects ever since the BOJ chose to end ZIRP back in 2006. So far this exercise is almost remnisient of that famous play by Samuel Beckett. A clear sign that a structural break has occurred in the analytical discourse comes from the recent writings by Morgan Stanley's Takehiro Sato and not least this specific note in which he splendidly argues the case that headline inflation pressures won't necessarily spill over into core inflation. The idea that cost-push inflation can lead to a reflation story appears to rest on the belief that expanding corporate margins fed by price hikes can allow depressed real wage levels to recover. However, for non-durable goods we cannot expect a powerful volume boost from a consumption spurt even if prices rise, and if sales volumes are slumping corporate earnings would presumably come under pressure. The household survey data for January-March in fact show that real expenditure on items for which prices have risen (mayonnaise, canned seafood, bread, instant noodles) fell across the board. I would be hard pressed to deliver the argument more succinctly. There are two important points here. First of all we have the point that no matter how far up those mayonnaise prices have to go it won't likely lead to front loading of expenditures. I completely agree with Sato when he argues that rising food and energy prices won't lead to hoarding (well, gas perhaps but that is hazardous). In fact, and if my readers will dare venture back to econ 101 (if possible) the cross-price elasticity of such products with respect to other goods/services will be high meaning that as headline inflation graps hold demand for these will fall. This is especially the case when real income growth is flat trending to negative. However, cost-push inflation as a concept is not of course limited to headline inflation. This brings us to the second point. It is by now well known that input/wholesale prices are rising across the board in Japan but while these pressures are finding the consumer in the form of elevated energy and food prices it is not, to any significant degree, finding its way to consumers in the form of goods such as durables, textiles etc. This tells us an important story about the price and demand dynamics in Japan. As Robert Alan Feldman put it at some point; there is something funny about Japanese consumption. This "funny feeling", if you will forgive me my pun, has something to do with the demographics of Japan and how the capacity for mustering demand pull inflation is simply not there to any significant extent. This also finally means that inflation pressures will have a tendency to clog up in the value chain as companies find it difficult to pass on wholesale price increases to consumers, and the extent to which they do; it will have a very direct impact on consumption figures. Speaking of which it seems that the Japanese consumer has now finally succumbed to the pressures of headline inflation rolling in over the shores of Japan. The visual inspection tells a clear story then. The Japanese consumer put in an unexpectedly strong showing in the first months of 2008 which was also a contributing factor in presenting a more than respectable Q1 GDP figure (although exports as ever accounted for the lion's share). In April and May consumption however accelerated its decline with -2.7% and -3.2% y-o-y respectively. Anything short of a veritable summer shopping frenzy in June will mean that consumption is likely to be a significant drag on GDP in Q2. As per usual Ken Worsley is watching incoming consumption data like a hawk. Judged by his account especially May seem to have been a tough month for Japanese retailers et al. Further snippets provide break downs in terms of supermarket sales which fell 1.1% in May as well as nationwide department store sales falling 2.7%. Japanese consumers are quite literally cutting back across the board, both in terms of spending on food and gasoline but also in terms of services. Spending on durable goods rose in May after three months of consecutive decline. In terms of the outlook it seems as if consumer confidence in Japan can only go one way at the moment. 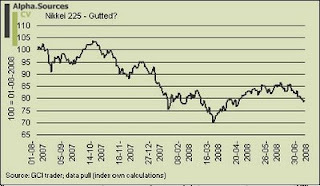 With an index running at 33.9 points it stands at a five time lows close to the all time low marked in 2001 at 33 points. The plight of the Japanese consumer is understandable but also worrying. It is understandable because the current bout of stagflation is sure to pinch consumers across the global economic edifice but the speed and rate of pessimism and drop in real activity is quite severe in Japan. In terms of overall demand dynamics it tells an important story about the ability of Japan to shield itself from what comes next in terms of a slowdown in exports and industrial production. One thing is sure in this regard. Even if Japanese employers increasingly are beginning to convert part time workers into full time workers the increase in wages cannot, and not by a long shot, keep up with the pace of headline inflation pressures. 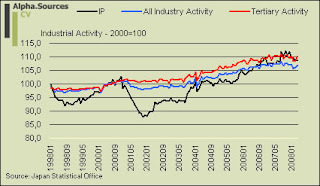 Turning to the corporate sector and thus the important data point of industrial production Japanese companies surprised us with a strong showing in May. For good measure the graph below does not include May figures as the index I track for these analyses lag the one reported by Edward linked above. The graph is still instructive I think. Industry activity as a whole is now decisively situated on one of those famous plateaus. Moreover, the tendency seems to be one of decline. The important point here is not that industrial production and corporate capex will plummet but more so that the very impressive readings from the latter part of 2007 will be replaced by a more moderate growth clip. In a Japanese context this is significant since the nexus of industrial production and exports is so vital to keep the economy from stagnation or outright recession. As with the consumption sector the outlook for corporate activity is increasingly looking weaker by the day. Business confidence declined to the lowest in four years on the back of surging commodity tests. Moreover, the widely watched Tankan survey for June, see Takehiro Sato for preview and background, confirmed that momentum is winding down significantly in Japan's industrial sector. Especially companies' expectations of profits deteriorated markedly with companies expecting profits to decline 7% in the coming quarter (Q3). Yet, not only from an accounting perspective are Japanese companies beginning to sail into dire straits. Judged by the recent performance of Japanese equities the extent of downsizing in terms of value destruction/discounting is quite extensive. It should be immediately noted of course that global equities in general seem to be facing much more lackluster times having decisively left the bull pen to go into the woods searching for the bear. However, the recent days' performance of the Nikkei 225 are breaking all kinds of scary records. Interestingly and as an important differentiation to the whole debate on decoupling it seems as especially the incoming slowdown in emerging markets (China and India) is having an effect. In essence, it seems as if Japanese companies, like the consumer, are getting pinched at the moment. If global momentum continues to deteriorate we should expect headline industrial capex figures to exhibit considerable relative weakness in the months and quarters to come. On a more structural note and even though it is formally unrelated I could not help but feel vindicated by the recent news from the political scene that the government is considering a tax cut aimed at companies to boost their competitiveness. Now, whenever the debate on fiscal policy in Japan homes in on tax cuts it is sure to send shivers down the backs of officials in the ministry of finance. As such, with a debt/gdp ratio running at about 170% you don't just dole out tax cuts without having a plan to raise taxes in another place. And if you do, those feathers provided by recent debt rating upgrades may soon be ruffled. In other words, we are talking about the fine art of redistributive policy. In this specific context I got that familiar feeling of deja-vu when it transpired from Bloomberg's report that the government would, or was contemplating to, finance tax cuts by imposing sales and income taxes. It is of course never that simple, and while Japan's government may simply be responding to sound advice from the OECD this discourse of easing the tax burden for companies by tightening fiscal policy in the context of consumers is not new in Japan. It is important to understand then that the extent to which consumption is taxed as a way to ease conditions of companies will only solidify the growth path onto which Japan is now situated. I don't believe that this is a question of one or the other but I do think it is important that policy makers (and investors) are aware of the consequences. Whether the lowering of corporate tax rates will lead to a marked increase in FDI is debatable I think. The channel by which such investments would flow to Japan would not, I think, be based on the exploitation of a buoyant domestic market. However, if Japan can succeed (and in many ways this is a fait accomplit) in becoming one of the main links to the Indian and Chinese growth history, FDI could be expected to come in on this account. This would then be the kind of FDI which promotes export activities. Shifting gears and turning to the external sector and the JPY a couple of interesting developments have emerged since we last convened. In a world of (largely) free flows of capital it is only natural that the currency of the third biggest economy commands much attention not least because of the extraordinarily low relative yield (0.5%) it carries. Below is a chart of the major Yen crosses as an index with the beginning of 2006 as the initial value (100). 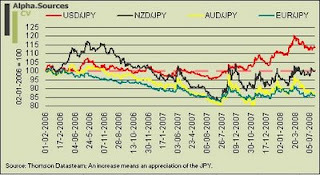 It can easily be observed how the JPY depreciated steadily up until August 2007 after which the credit turmoil grabbed hold. Especially the USD/JPY has seen its value spike due to a depreciation of the USD but also the NZD/JPY has seen a correction. As regards the JPY (and to some extent the CHF as the other "low-yielder") there are two major themes for investors to watch out for; both of which I have elaborated on extensively. To distinguish between the two it is fruitful to think of one representing fundamentals and one representing market sentiment. The latter theme is well known by market participants and FX punters; in the context of my own analysis I even made a paper out of it which shows how JPY and CHF crosses, since the credit turmoil, have acted as very finely tuned risk sentiment gauges in the market place. This was epitomized by the spring market action where turmoil surrounding Bear Sterns and other juicy events brought the Yen as high as to 95 to the USD on the back of "perceived" unwinding of carry trade positions. More specifically, I also show in my paper that the negative relationship between low-yielding currencies and risk (as measure by stock market indices) is very fine tuned indeed even to such an extent that the negative correlation can be tracked on a daily return basis. Yet, correlations rarely hold over an indefinite time span and one should at least expect correlations to exhibit variations in terms of strength. This is certainly true with the correlation noted above as we saw recently how the correlation between the USD/JPY and SP500 broke out of range. This brings us to the second theme and one which we could then label fundamentals. Under this narrative lies the fact that with an interest rate of 0.5% as well as an economy characterised by export dependence money will have a strong propensity to flow out in search for yield. Such a process and subsequent decline in home bias will also quite naturally put an effective floor for the appreciation of the domestic currency. In fact, over time one would expect the currency to depreciate steadily on the back of such outflows. Various versions of carry trade will have the same effect of course. As always there is a demand as well as a supply side here. The interesting thing is that it is difficult to see just where one begins and the other ends. One narration of the market would then be to see Japanese savers as the demand side and the rest of the world's yield as supply. This theme which encapsulates the need for an ageing economy to earn asset income from outside its borders to fuel growth (export dependence remember) was described in my recent post on how Japanese savings are going for yield. Another way would be to turn the tables and narrate the pool of Japanese savings as the supply side and foreign investors not to mention asset managers as the demand side. In this way, an abundance of capital and a 0.5% interest rate provide strong incentive for asset managers and companies to seek out funds in Japan. The surge in the sale of samurai bonds would be a case in point here. Whatever way we choose to look at this it is imperative that investors and analysts alike consider both the effects cited above. As for immediate forecasts on the JPY, there seems to have been a structural break. It appears then that the recent turn for worse in equity markets have not prompted the JPY to hurry back towards Spring's high levels. In stead, the fundamental story is taking over as forecasters across the board are now predicting the USD/JPY to move towards 115 which interesting was about the same value I marked out for 2008. Up until this point the risk sentiment argument seemed to have thoroughly proven me wrong but now it is perhaps time to pull out the idea of a USD/JPY back in pre-credit turmoil 115-120s? End of the Line for Japan? How to connect the dots then? In the text above I mention the Samuel Beckett and his existentialist play Waiting for Godot in which Estragon and Vladimir attempts to pass time as they wait for Godot to arrive. Quite a tough one to sit out in the theater I have to say, and so has it been with my continuing recession call for Japan. It is certain then that the GDP performance churned out in Q4 07 and Q1 08 have resembled anything but recession. Yet, Japanese GDP figures are notoriously volatile (and thus inconclusive in the big picture) whereas indicators such as industrial production are more solid. More generally, as Edward put it recently indicators from the Japanese economy are now showing weakness everywhere. In this framework it is difficult to escape the fact that Japan, if not heading for one, will be flirting with recession in the quarters to come. I am not pulling this out of thin air either. Leafing through the analyses by Japan watchers will also confirm that the R-word is being used with more regularity than only a months ago. What is significant I think is that the Japanese consumer now decisively seems to have thrown in the towel suffering under the yoke of stagflation. What remains is then corporate capex/industrial production which should not contract as such but grow at a much slower pace. 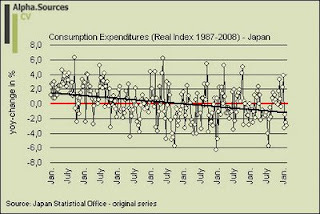 This need not push Japan into a recession but it definitely means that momentum is heading down. As regards monetary policy I think I need to devote a separate piece to really get down to business. However, and while many expected the new governor Masaaki Shirakawa to be of the hawkish pedigree he has so far not been able to steer the BOJ away from its perpetual holding position. The BOJ will not, it seems, lift rates as long as core-of-core prices are in negative territory and to the other side the situation is not deemed seriously enough to re-introduce ZIRP. This latter option would also most definitely test the newly found G8 stance against inflation and at this point I think the BOJ is quite happy staying out of the limelight. I dare not call it a recession in Japan just yet but I will say that the signs are mounting that Q2 will mark a structural break in headline GDP figures for Japan. The key as always is industrial production and exports and the extent to which activity can be kept at a pace to compensate the obvious slump in domestic demand. The ECB - A Token Move or Signs of More to Come?